Pipe marking is critical. Most people don't understand that a single building may have miles of pipe; those pipes need to be labeled for safety, security, and convenience in maintenance. Proper pipe labeling often includes labeling for flow direction, a task that is significantly easier with arrow labeling tape. When combined with the SafetyPro label printer, you've got a complete pipe marking solution! 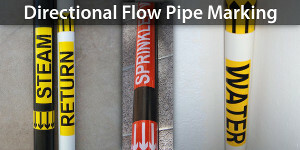 Create custom pipe labels with regulation-height lettering and colors, in a matter of minutes! No pipe labeling job is too much to handle; give us your best shot, and we'll show you how to save time and money in pipe labeling. When you're labeling pipes, don't forget their cousins the ducts! 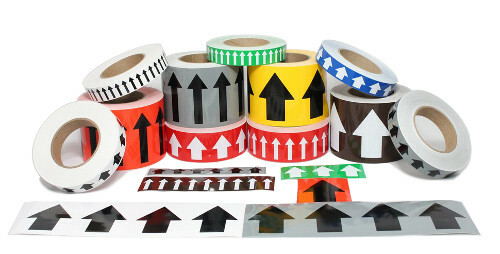 Labeling ducts for flow direction with our arrow-form labeling tape is easy, and saves you time and money when it comes time for servicing. 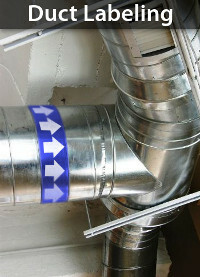 You can quickly label duct flow direction in a matter of minutes, start to finish. Duct labeling was never easier! 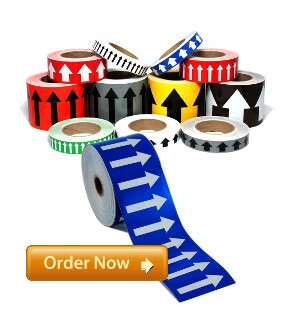 Don't forget to check out the SafetyPro custom label printer to create descriptive custom duct labels for your facility. Labeling for flow. You can create labels that match your flow direction arrows, with custom information to be used by your HVAC maintenance, facilities, and other personnel. We're ready to help with your pipe or duct labeling project, all you have to do is call! 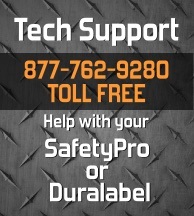 Our free tech support starts with your first call, and continues for as long as you've got labeling projects to be completed. No company, anywhere, competes with our level of technical support! We have a variety of size, color and style options to choose from; in everything from 1" to 4" widths. Click below to browse our selection!